Physicists at The City College of New York have used atomically thin two-dimensional materials to realize an array of quantum emitters operating at room temperature that can be integrated into next generation quantum communication systems. Researchers from the groups of City College Professors Carlos Meriles and Vinod Menon developed for the first time an array of on-demand single photon emitters that operate at room temperature. 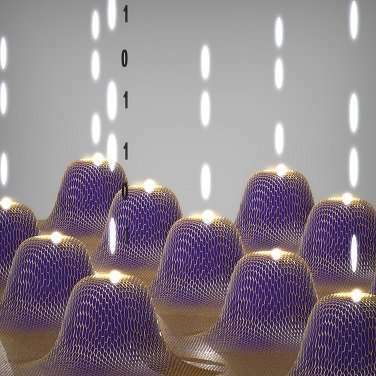 Using an atomically thin material, hexagonal boron nitride (hBN), placed on nanopillars, the researchers demonstrated single photon emission at the pillar locations. In simplest terms, the breakthrough allows one to know where the single photon emitters are located. Single photon emitters are essential building blocks for next generation quantum communication and computing protocols as they can be used as a quantum bit (qubit). The secure communication comes about because of the quantum property of the single photon making eavesdropping impossible. The current breakthrough has solved a long-standing and practical hurdle of realizing deterministic single photon emitters at room temperature. Previously, very low temperatures were necessary or the photons were hard to extract using other materials such as diamond, noted Menon. And, if single photon emission did occur at room temperature, it happened at random locations. The work was carried out by graduate student Nicholas Proscia, post-doctoral researchers, Zav Shotan and Harishankar Jayakumar, and undergraduate students Michael Dollar and Charles Cohen, in collaboration with theory groups from the Australian National University (Marcus Doherty and Prithvi Reddy) and the Center for Physical Science and Technology, Lithuania (Audrius Alkauskas). Might want to look at optical rings for higher photon ev,em,rotation of transmitted quantum photon info.